The socks are finished. The next pair has been started! Here they are—I wanted a photo with toes for Ravelry—They have taken long enough! I didn't get a much done on my next pair as I hoped. My daughter needed a favor—it is so rare she asks for anything, I hopped to it. Besides, it was a good way to spend time with her. So an afternoons jaunt filled a few hours of the day. It cut into knitting time, (and totally eliminated my plans to ball up a few more skeins of yarn)—but not so much that I wasn't able to finish the Black and White socks—and to make a small start on the next pair to be. Here are the new socks. No, I am not knitting solid green socks. Nor am I knitting solid yellow ones. Nor am I knitting more than 1 pair at time. Yes, I am planning to knit them in the round and not flat. And Yes, I am planning to use a self striping/patterning yarn. I like these socks already—I am almost done with the fancy edging on the cuff –and after that, there won't be much fancy work at all! Just this little fillip to make them special and take them beyond totally generic socks. You'll have to wait till tomorrow to see how the green and yellow work into the cuff—and to see what yarn I am working with—and it might take a day or two more to see the full effect. 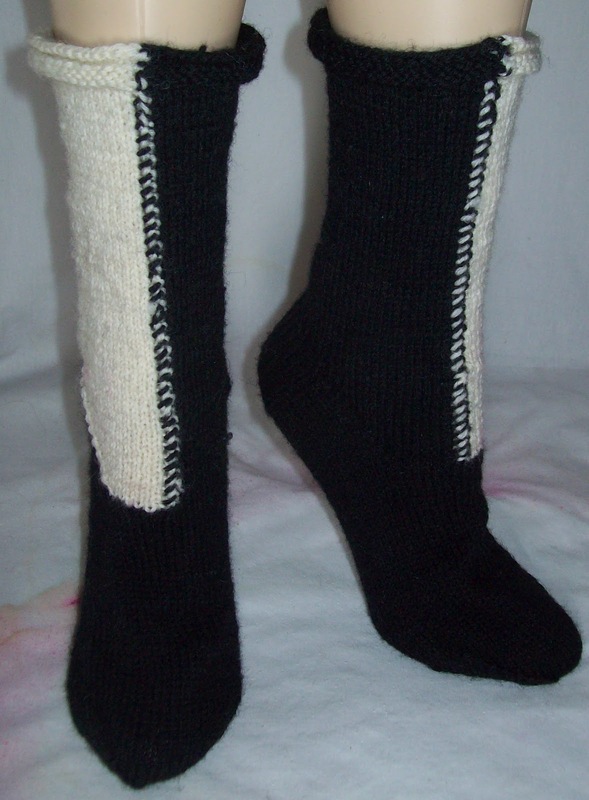 Hopefully, I will churn these simple socks out before the end of the month.